There’s benefit songs like “We Are the World”, “Do They Know It’s Christmas?”, and more recently the Haiti earthquake benefit song “Wavin’ Flag”. There’s also protest songs like “Give Peace a Chance”, Neil Young’s “Let’s Impeach the President”, U2’s “Sunday Bloody Sunday” and many many more. These songs are usually constructed as anthems, sing-a-longs, songs for people to rally around. Then you’ve got a song like David Sylvian and Ryuichi Sakamoto’s “World Citizen” – about the human cost of globalization and the far-reaching negative effects of superpowers’ actions and policies (most specifically the United States). It’s a song that’s more contemplative musically and lyrically than most songs of its ilk, written more for the individual, the thinker. There are no stirring, uplifting choruses, no grand proclamations. Rather, it’s a lush soundscape/wordscape meditation on the state of the world. Interestingly, the song exists in two versions – “World Citizen (I Won’t Be Disappointed)”[lyrics] and “World Citizen” [lyrics]. Both versions have the same musical core, but contain different lyrics and different instrumentation. Sylvian wrote the lyrics for the “Won’t Be Disappointed” version first at the request of sometime writing partner Sakamoto for an anti-war music project Sakamoto was working on. Not long after, they decided to write a more pop oriented song with the same title and ideas. The result was the second version, simply titled “World Citizen”. Version #2 (the “pop” version, though it’s not really your average pop song) is much more specific. It references 9/11, the displacement of native people in India, and U.S. support of corrupt regimes. “Who’ll do away with flags?”, he asks – which would truly create a world of world citizens. Defined, a world citizen is a person who does not support or believe in geopolitical boundaries or nationalism. In essence, one who considers themself a citizen of the world. It’s not a new idea and in fact goes back to ancient Greece. More recently, Albert Einstein was one who considered himself a world citizen and is quoted as saying “Nationalism is an infantile disease. It is the measles of mankind.” Today there’s an organization called The World Service Authority (The World Government of World Citizens) and also a World Citizen Foundation. Though, I don’t think Sylvian is specifically referring to the World Citizen movement or any organization, but rather to the concept of a world citizen. A person who believes in human rights for all, equality, and peace. A concept that’s become at once more idyllic and yet more distant now in the 21st century. 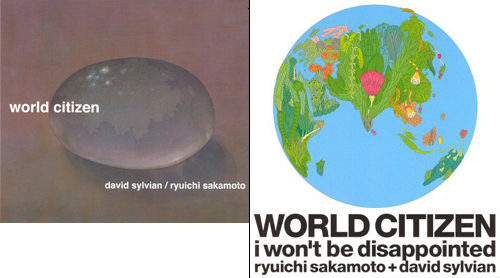 “World Citizen” (both versions) was released as a 5 track single (short versions, long versions and one remix) both in Japan and in the UK (different album art for each, as shown above) in 2003. The “I Won’t Be Disappointed” version also appeared on the soundtrack to the 2006 movie “Babel”.